This is the 2nd instalment of a 3 part ride report. The lads left me at Saint Barbe on Friday, July 22 and continued on to their quest of gravy, dressing and fries. 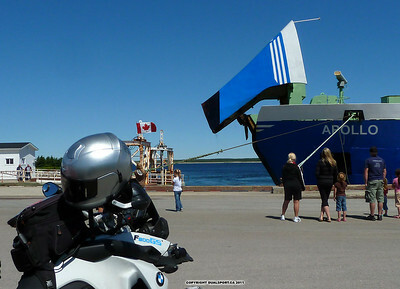 The ferry to Blanc Sablon, QC costs $11.50 and takes about an hour. 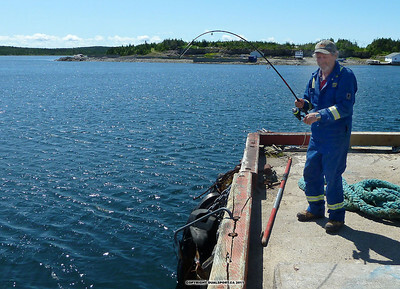 I had some time to kill so I chatted with a local fisherman and watched him pull out about dozen fish in 10 mins. "Catch and release B'y" was his motto. At least that's what I think he said. The Apollo arrived on schedule and I boarded last. Once in QC it takes about 2 mins to ride to the Big Land. I wasn't quite sure what to expect for weather as there was still snow in the hills. I fuelled up in town and once again in Red Bay for a top up. I carried 10 litres of extra fuel for this trip which will come in handy later. I had to take a pic of the Community Centre in Red Bay. The people there were nice enough 3 years ago to supply us with a dry place to stay for the night. We rolled into town at dusk, in the rain, with no place to stay. That's just how we roll. 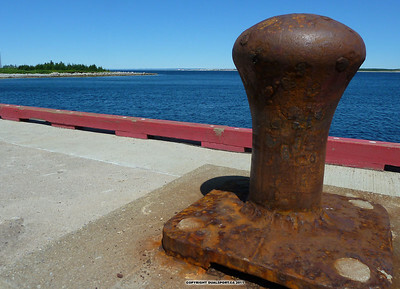 The TLH starts in Red Bay. I was beginning to wonder about my choices in riding this alone as the dirt road was covered in ball bearing like rocks. I thought for sure I'd be down in no time.Then I remembered to air down to 28psi from 38. Mucho better. My Mitas tires had 2500k on them before I started this section of my trip. I believe I made the right choice in tires, even though it didn't rain on the TLH for me. The scariest section of the highway are the metal grated bridges. The bars go side to side when you ride across. I made it about an hour past Port Hope Simpson and decided to camp for the night. I was looking for a place to "Ninja" camp and went down a dirt path that turned into a hill with no place to turn around. I thought holy FK, I'm screwed now. I'm all alone, on a 500+ pound bike and can't turn around. The important thing to remember is not to panic or get mad when stuff like this happens. The one thing I regret is not taking a picture of my predicament. After a half hour of my 300 point turn, I managed to get going back up the hill and out to the road again. Phew, that was close. I decided to be a little bit smarter at that point. I found a place up the road to camp. 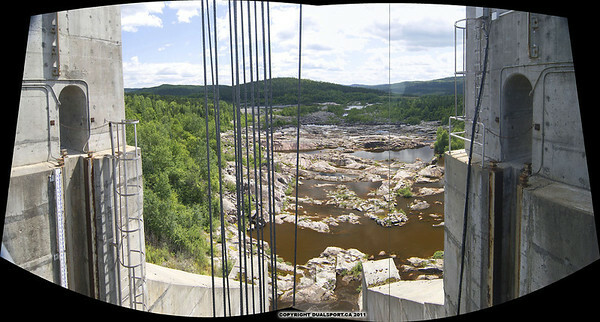 It was an abandoned quarry of some sort. While I got unpacking I see that I still have problems with remembering to tighten the lids on my coffee creamers. White dust everywhere. Glad the fuzz didn't pull me over for a check. After sleeping like a baby, I woke to 3.5°c Not quite frosty, but cold none the less. I managed to almost loose my sleeping bag off the bike. Good thing I strapped it through a few eyelets in the bag. I saw a few other bikers along the way, some of whom I think I knew. I came across a "drifter" car at one point. I'm not sure of the story here but it looked like someone got into a bit of trouble. Not 5 mins later some tool in a pickup was coming around a curve, full drift in my lane. I veered right and he hooked up straight and we passed each other a little dustier. Idiot! Once in HVGB I was fuelling up and who shows up but Brooksie (Nigel) He's in town flying choppers and living the dream, not doing diapers. He and his buddy Tom invited me to lunch so I said sure. Thanks a million for lunch Nigel. It was very much appreciated. The TLH is a LONG road. (duh) You can ride it all day without any issues but you have to be 100% concentrated, at least I did. As soon as you take your eyes off the road to view the sights, a stone or a groove in the road can take you out with bad consequences. Some of the big rigs slow down for you, some don't. I found riding at 100kph was fine. If the rocks got deep, then a down shift or 2 was required and pinn it. 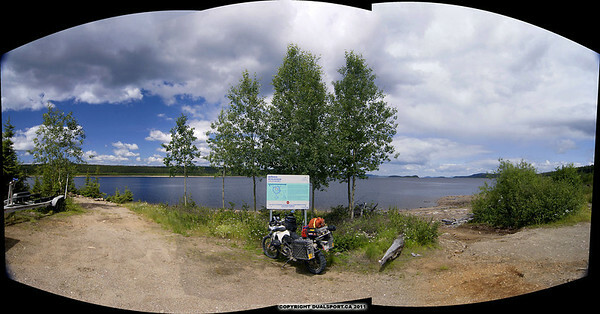 I made it into Churchill Falls to look for fuel and a place to camp. I have seen pictures of the falls in the past. It sure looks different now. Almost dry. I found no place to set up a tent so I continued on for about an hour. Then I found a perfect spot. It had water, lots of drift wood for a fire and very few bugs. I slept ok but was thinking about the can o'tuna I had for supper and hoped a bear hadn't smelled it. I washed it in the lake so I figured I was OK. Huge trout were jumping a foot out of the lake at night but I wasn't quick enough to grab a picture. Roger on his RT fully kitted out and even had extra fuel plumbed in. Nice. We chatted for a bit and he complained about the washboard ripples in the dirt. "it is what it is" he said and rode off to more of the same and then some. 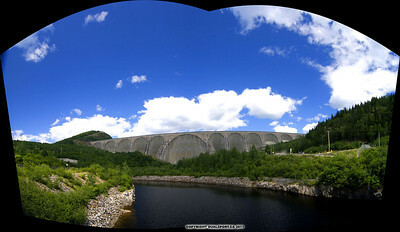 On google maps, Lac Manicougan looks so impressive. It's a crater from a meteor strike from millions of years ago. Once you stand beside it, it looks just like a lake. Imagine that? The highway turns from dirt to pavement many times. So many I lost count and stopped airing the tires up and down. One time I aired down only to find pavement around the next corner. ARGH! Fun roads to Manic 5. WOW is all I can say. Pictures just don't do it justice. It's massive! I believe here is where the road turned to pavement for the last time. To be honest, I was glad to see it but at the same time sad to leave the dirt. As Bubbles says it is a "catch 23 situation" Hard to explain to those who haven't been there. You'll just have to go before it's too late as they are paving it. 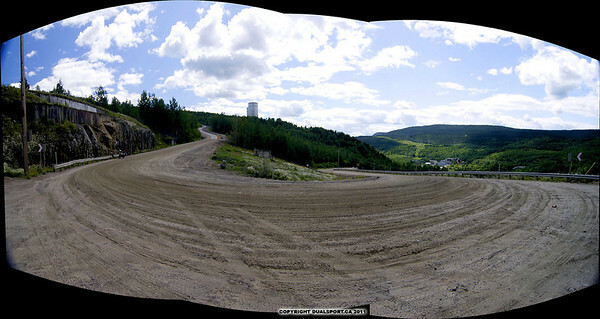 From Manic 5 to Baie-Comeau is a wonderful road with twists and turns to keep anyone entertained. I couldn't find any place to camp in BC so at 5:00 I decided to get a ferry to Matane. 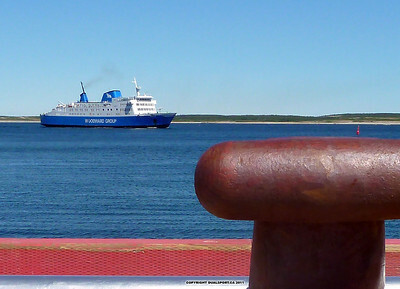 I waited for hours for a ferry to arrive. I was told by one of the terminal employees 6:00. His English was as good as my Francais so I shouldn't have been surprised at the misunderstanding. Ticket collecting was at 6:00. 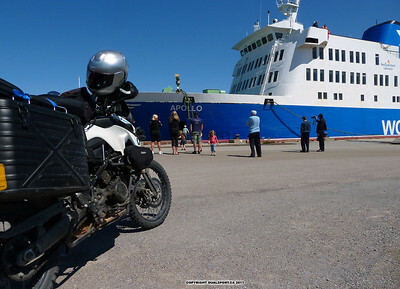 The ferry arrived at 8:15, I got on board at 9:00 for what I thought was a 30 min ride. As I got into camp, the lady spoke very little English. She was having a hard time printing off my receipt. After the 3rd try she said "FOOK" so I had to say "TABERNAQUE"
We had a laugh after that. Nice people these French. 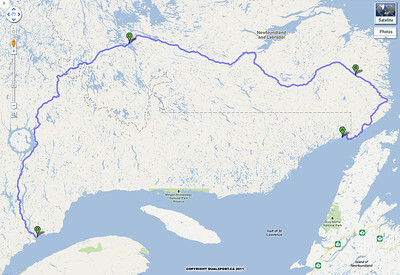 So that's my story of the Trans Labrador Highway. Certainly worth doing it again but this one is off my bucket list for now.